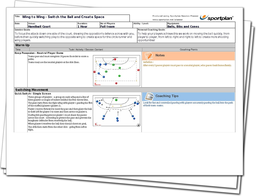 This Sportplan session works on creating space when you're up near the opposition's end zone - switching the ball, setting a screen and using both wings to maximum effect! These advanced passing drills have been designed to help your players draw the opposition to one side of the court, as if the ball were a magnet, before reversing the polarity and switching the ball through a series of skilled passes to open up space - get the ball to your circle runner or wingman and get the shot off on goal! Through the course of this session you will be able to guide your players through a series of progressively more challenging plays - starting in an uncontested drill and gradually upping the intensity with more complex passing combinations and the pressure of playing with defenders!